Help get the word out: Nothing defines “together” more than “Yachad.” While Yachad, an organization “dedicated to enhancing the life opportunities of individuals with disabilities ensuring their participation in the full spectrum of Jewish life,” has been in existence for 30 years through the Orthodox Union nationally and internationally, Federation of Central NJ (Federation) brought it to Middlesex County after being approached by a group of parents with children of special needs. Federation was interested in expanding programming. Yachad responded by starting a chapter servicing Middlesex County in the fall of 2012. The Central NJ Chapter of Yachad/NJCD, headed by co-coordinators Tobey Lass Karpel and Bracha Avraham, is under the umbrella of the NJ Yachad, with Chani Herrmann as director. Their mission is to help people navigate through life when they have a family member with special needs. “We run an inclusion-based model, not programs just for individuals with special needs,” says Karpel. Currently, there are 30 families of individuals who have special needs in the Central NJ Chapter. They service individuals from ages 2-40, with different levels of functioning, including those with Down Syndrome. Mainstream peers make up another 20 participants. The idea is for special needs individuals to have a place in the Jewish community. Karpel noted they work on doing that by providing social programs for individuals with special needs, as well as mainstream kids. They also offer one-on-one peer visits. Karpel says being treated in the same environment as people without special needs is equalizing; individuals without special needs who come as peers see those with special needs as people first, with likes and interests, not as “others.” The peers are often students coming from local day schools, or locals from the community. Karpel added that being involved at Yachad gives them confidence, relationships and friendships. A “J-Teens” group was started by Federation to teach teens about philanthropy. Federation guided two individuals who had an interest in getting a grant for horseback riding. One of the peers was interested in horseback riding and the other in people with special needs. The teens donated their own money and Federation matched it. They reached out to organizations for grant proposals. The teens voted on how the grant money would be used. 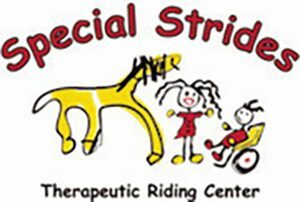 Central NJ Yachad received the grant and started a horseback riding clinic, which is run by counselors who are trained in horseback riding by Special Strides Therapeutic Riding Center. Yachad got together with Special Strides Horse Farm in Monroe, where Laurie Landy, who opened the therapeutic center in 1998, arranged for horseback riding for individuals with special needs. On a given Sunday they have 10 special needs individuals from Central NJ Yachad enjoying the clinic. Aside from the clinic, they run Shabbat buddies where peers are sent to special needs homes for Shabbat, and Moms’ Night Out, which provides fun activities, not as a formal support group. Eight moms participated last time when they did sushi making. Other times they have had a paint night or yoga. With help from Federation and Yachad, they offer moms’ night once or twice a year. They listen to the desires of the families, who this year requested more moms’ nights. Karpel says what makes their organization unique is that they are constantly changing and evolving based on the needs of the families they service. Also offering sib shops (sibling workshops), programs for siblings of individuals with special needs, they are always looking to grow and expand their programming. While they do not offer respite care, all programs are two hours, allowing parents free time. The Central NJ chapter is connected to all other resources Yachad has to offer, such as summer camp and Shabbatons. Programs such as the clinic are specific to the Central NJ area. What they need are individuals with special needs to come to their door. Over the years Karpel has been with the program, she estimates she has seen 75 individuals come and go. Her vision for expansion sees all individuals with special needs in the community getting involved. She added, “If you tried us two years ago, we are not the same group. Talk to us. What do you want to see? The opportunities are endless.” Through gifts and grants they are constantly expanding their monthly programming to provide for the community. They need input on which programs to expand. Currently, the chapter has only one group of programs, with a short-term goal to divide younger and older individuals. This article was written by Sharon Mark Cohen for The Jewish Link of New Jersey.